A boost in fiber digestibility can improve passage rates and forage intake. The end result is more milk produced. 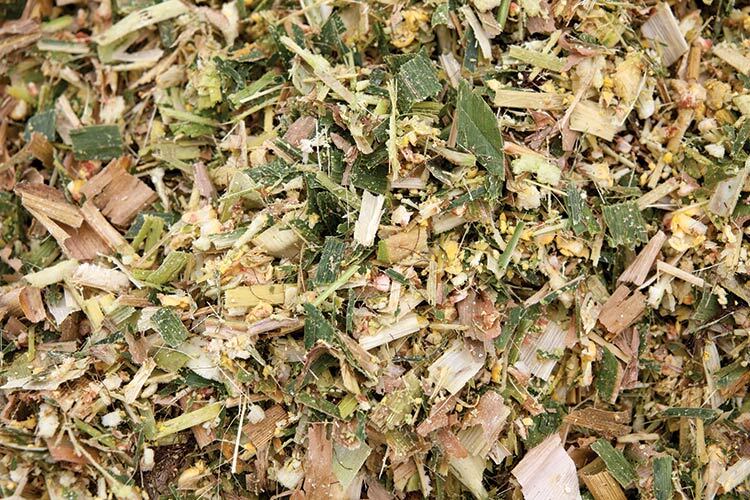 Corn silage is the predominant forage source used in dairy cattle diets to supply adequate levels of energy and physically effective fiber to high-producing cows. Meanwhile, starch and fiber are the main sources of energy for dairy cows fed corn silage-based diets and, therefore, improvements in digestibility of these nutrients may boost milk production or reduce feed costs through enhanced feed efficiency. Here we will provide an overview of the benefits of improving fiber digestibility in corn silage and to discuss strategies to make it happen. Greater fiber digestibility is associated with a chain reaction that begins with a greater rumen passage rate and ends with higher milk production. Feed particles have to sink and reach a specific size threshold to cross the rumen exit door, the reticular-omasal orifice. In another words, it requires particle reduction, which is achieved by mastication and digestion. Overall, forages with greater fiber digestibility are more fragile and undergo greater particle size reduction. This greater flow of particles leaving the rumen allows for enhanced intake of dry matter (DM) and energy, thereby boosting milk production. For example, a review from University of Wisconsin observed that cows fed corn hybrids selected for greater fiber digestibility had 2 pounds per day greater intake of DM and 2.7 pounds per day more milk production. Furthermore, data from Michigan State University suggests that for each percentage-unit rise in ruminal in vitro fiber digestibility, there is an expected gain of 0.4 and 0.6 pound in intake of DM and 4 percent fat-corrected milk production, respectively. Greater energy intake is not solely responsible for higher milk production. Changes in chewing behavior also play a major role. Several studies indicate that cows fed silage with less digestible fiber spend more time eating to consume similar or lower amounts of diet. This extra time eating is often at the expense of resting time and may impair production. Physical and chemical factors may affect fiber digestibility in the rumen of dairy cows. In theory, shorter particles have more surface area for bacterial attachment and fiber digestibility. Thus, many attempts to alter the physical aspect of the fiber fraction in corn silage were through reduction of chop length at harvest. However, results from most studies do not support this concept. Perhaps these smaller particles are not retained in the rumen with sufficient time to allow for improved fiber digestibility. In addition, shorter particles provide less physically effective fiber. It is well established that sufficient physically effective fiber is required to maximize rumen function and milkfat synthesis. From a chemical perspective, fibrous components in silage are cross-linked to lignin, which is indigestible and inhibits digestion of these components. Thus, technologies and practices that either reduce lignin content or its connection to other fibrous components are desired. Various factors are thought to affect the lignin content and bonding to other fiber fractions, including maturity at harvest, chop height, and hybrid types. Delayed harvest with the purpose of obtaining greater yields of starch may sound advantageous; however, like other forage crops, fiber digestibility of corn plants is reduced due to greater stover lignification during maturation. Therefore, targeting delayed maturity at harvest for greater concentrations of starch may come at the expense of stover digestibility. Another factor to consider with the harvesting of drier corn silage (greater than 40 percent DM) are potential packing issues and poor aerobic stability. These issues elevate mold and yeast counts, and data from the University of Delaware demonstrated that yeasts from spoiled silage reduce the capacity of rumen bugs to digest fiber. Another harvest option to reduce lignin concentration is chop height. Lignin is an important structural component concentrated in the bottom part of the cornstalk. With enhanced chop height, more lignin is left with the portion that remains in the field and, thus, digestibility of the harvested material is greater. Results from a recent industry-university collaborative study from our group are presented in the table. Although our study compared 6 versus 24 inches, these results are similar to other trials comparing 6 versus 18 inches of chop height. Briefly, DM yield is reduced as the row-crop head is raised. This result is consistent across several studies. However, lower DM yields are offset by an increase in the milk-per-ton estimates at the higher chop height. Greater milk estimate is a response to the greater fiber digestibility and starch concentration of the harvested material. In addition, most studies reported that estimated milk per acre is reduced by only 1 to 3 percent with high chop. Also, more of the high-chop silage could be included in the diet, lowering the amount of corn grain being added. This provides an added economic benefit to high-chopping corn. A farm team discussion with your nutritionist and crop consultant is advised to determine individual farm priorities for maximum yield versus higher quality prior to the establishment of new chop-height guidelines. Those needs may vary in different years, depending upon the yield and quality of the crop and existing on-farm inventories. Hybrid selection is a reliable strategy to improve fiber digestibility in corn silage. Brown midrib hybrids, for example, show year after year greater fiber digestibility than other hybrids. However, yield and nutritive value of hybrids varies from year to year and in different regions. Therefore, going through hybrid performance trial results near your farm and across several years is advised prior to selecting new hybrids. Efficacy of specific practices may vary when using different hybrids. For example, a study from Cornell University compared the use of enhanced chop height on different hybrid types. Results implied the needs to raise chop height on leafy corn hybrids, but no benefits existed for brown midrib hybrids. Greater fiber digestibility improves DM intake, resting time, and milk production by dairy cows. Alternatives to reduce lignin and its connection to other fibrous components are very likely the best options, but team discussions with farm advisers and decision-makers are recommended prior to the establishment of these alternatives. This article appeared in the January 2018 issue of Hay & Forage Grower on pages 20 and 21.